UC San Diego announced Wednesday that it has offered admission to more than 30,000 freshmen for the fall semester, almost 3,800 more than last year, and around 9,800 transfer students, up by more than 1,650. 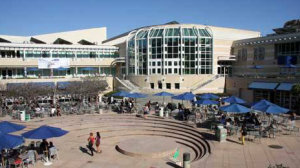 Price Center at UC San Diego. The students were selected from a record 84,209 freshman and 18,487 transfer applications. The admitted freshmen have an average grade-point average of 4.12, while the average transfer GPA is 3.61, according to UCSD. Since the students offered admission by UCSD have likely been accepted elsewhere, the actual numbers of those who show up on the La Jolla campus in September will be considerably lower. School officials said they anticipate enrolling roughly 5,660 freshmen and 2,900 transfers. The admitted freshman class includes 58 percent more Mexican-Americans and 46 percent more African-Americans, according to UCSD. The most popular majors chosen by the freshman class are biology, economics, math, chemistry, and mechanical or aerospace engineering. For transfer students, popular majors included economics, biology, math and psychology. School officials said they 16 percent more admissions slots went to in-state students than last year, while almost 18 percent more transfers lived within California. Overall, the University of California reported that 15 percent more students residing in the state were offered admission at one of its nine campuses than last year. UC has been criticized in recent years for relying on out-of-state students who pay higher tuition.